Welcome back to AJPW! 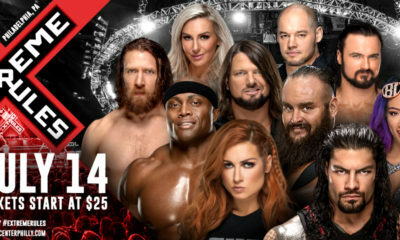 We’re gonna talk about the last big show before this year’s Champions Carnival coming up in early April as we have a few title matches in this show that I couldn’t resist wanting to cover it. We got some dealing with revenge along with one trying to make history. How’s this year’s Champions Carnival gonna shape up? Review: Our opening contest is a six-man tag team match with our young lions, Atsuki Aoyagi, Danji Tamura, and Hokuto Omori taking on three members of Evolution, Atsushi Aoki, Hikaru Sato, and Yusuke Okada. Going up against three people from the junior division is a fair start to have them all fight each other in this tag bout and a better view of how the young guys are doing. Will Evolution school the young boys or will they somehow get one of the biggest wins in their starting careers? As I’ve said, this match is mostly to showcase our future talent as they fight the vets of the game in the junior division. I do gotta admit that these three have definitely improved in the ring as they’re shaping up to be some of All Japan’s finest students. Evolution held off on their own and I’m glad they were their opponents for this match since they’re very easy to work with. Another thing I loved about the match is that they had a good amount of time instead of just being less than five minutes like how most matches will do. Yusuke and Hokuto are in the ring now and Yusuke would hit him with a Brainbuster for a two count and would quickly apply a Boston Crab onto him and Hokuto struggles to get to the ropes and once he does, Yusuke pulled him back in and would lock it in more as he would tap out to give Evolution the victory in a solid match. Review: We got another six-man tag team match here as Jun Akiyama, TAJIRI, and Ultimo Dragon will be taking on Black Menso-Re, Masanobu Fuchi, and Takao Omori. It’s been quite a while since we’ve seen Ultimo Dragon wrestling in All Japan, so I’ll never complain to see him in the ring. This is another match with the vets and Manso-Re for being a punching bag as it’ll most likely be a comedy style match. Which one of them will win? Menso-Re starting with Ultimo Dragon as he wanted him first, but TAJIRI would slap Menso before the bell would ring and we would kick it off right now. They would do a little bit before Jun and Takao get tagged in, but we all care about TAJIRI and Fuchi getting tagged in now as Fuchi would try to get his hands on him. TAJIRI would be the sneaky heel with leaving the ring to sit with the crowd so he could avoid contact in the match. TAJIRI would get back in the ring only to tag in Ultimo as the crowd would just boo TAJIRI. Fuchi would do his antics with the punch to the forehead as the crowd eats it up but everything would backfire on Fuchi as he would miss a Dropkick to make the crowd boo Ultimo which is a shocker. Ultimo would kick Fuchi and attempt an Asai DDT but Fuchi would turn it around to a Backslide as Ultimo would kick out. Both TAJIRI and Jun would both make Fuchi miss a Dropkick and taunt him right after to make the crowd boo them. Ultimo would get Fuchi in the La Magistral and he gets the win for his team in a rather entertaining match. Review: Our next match here is a tag team match as NEXTREAM members, Yoshitatsu and Yuma Aoyagi will be taking on members of Sweeper, Jake Lee and Ryouji Sai. Since Naoya is no longer Yumi’s partner, he’s gonna be paired off with Yoshitatsu this time around. Since all four of them are in the Champions Carnival, a win for either of them would give them some momentum leading to the tournament. Which one of these two teams will win and what will be the future payoff? It seems like Yoshitatsu has a little gripe with Jake Lee in this match as he seems to be disgruntled when he was in the ring with him, especially when Jake would just best him during the first sequence with the chaining. Ryouji and Yuma are in the ring now and Ryouji with a series of kicks in the match and have him in a submission before Yoshi would break the hold and just stared at Jake again. Yuma is really growing out on his own as an individual and you can see that when he’s not partner with Naoya. Yuma would have Jake in a Headlock but Jake would attempt a Backdrop Driver as Yuma flipped it into a Crossbody as Jake kicked out at two. Once Jake kicked out, Yuma would try to turn the pin into a European Clutch as Jake kicked out at 2 as even the referee was shocked by this. Yuma would run into him as Jake kneed him in the face and hits him with a Backdrop Driver as he pinned Yuma for the victory. Review: We have another six-man tag team match taking place as Atsushi Maruyama, KAI, and Zeus team up to take on Dylan James, Joe Doering, and Francisco Akira. KAI recently failed at Dragon Gate to win the Open the Twin Gate Championships, so he could at least try to win for his team but I think Zeus has a lot on his plate when it comes to their opponent since Dylan James and Joe Doering are a strong team to beat and wants to try and look powerful leading into the Carnival. Which one of these two teams will win the match? Zeus and Dylan would charge at each other right away to test their strengths with also some chops and a test of strength as the two appear to be evenly matched, which is no surprised. KAI gets tagged in and he calls Joe to get tagged in since he wants to fight him as Dylan honors that request and lets Joe have a turn on the fun. Joe would start to make him regret that decision as he had the upper hand on him at first but KAI would hit a few Dropkicks on him but Joe still wouldn’t go down as he tackled him and went for an Elbow Drop before KAI moved and quickly tagged in Atsushi. The juniors get a turn on the fun as Francisco showed more of his impressive ability. One problem I had with the match was that the last few minutes are incredibly sloppy with Atsushi missing most of his kicks to Joe in the corner, Francisco slipping on his Moonsault to the outside, which he thankfully caught himself and redid it again. The finish would be with Joe hitting Atsushi with the Powerbomb and it looked like he got knocked out as he took the pinfall despite his shoulder being kinda up, so it looked botched but the referee still has a job to do as Joe just left the ring and walked to the back possibly frustrated. Review: Our first title match of the show is Koji Iwamoto defending his Junior Heavyweight Championship against Kotaro Suzuki. The two fought each other in the A Block of the Junior Battle of Glory Tournament where Kotaro defeated Koji in the match but would eventually fail to win as Koji would actually be the one to win it all. Koji decided to defend the title against Kotaro since it was only fair due to him winning the match and wants to avenge that loss. Will Koji be able to retain his title again or will Kotaro get the upper hand on him again? Kotaro showed no mercy to the champion as fought him to the outside and Slingshots him into the turnbuckle post and DDT’s him face first into the mat as you hear the loud thud and damage has been done to Koji. Kotaro has beaten Koji before so he knows what he has to do to try and defeat him again as he worked on Koji’s neck a bit during the match and gets the heat from the crowd. I know Kotaro is a Freelancer and is mostly at NOAH right now due to being a champion there, I hope he does stick around a little bit longer since I feel like the division could really use him as he’s a very talented individual. Koji would try to outrun him after he dodged him to the outside and it appeared as if Kotaro would botch but he quickly caught himself and dived to the outside to land on Koji, getting the better of him again. Koji would finally be able to get a comeback as he hits an STO onto the ring apron to knock Koji down and most of the time, he would try to hit the Koko no Geijutsu but Kotaro would hold his ground to make sure he wouldn’t hit it but Koji would be able to deliver a German Suplex and a Dragon Suplex. Kotaro would land a few punches before Koji tried to hit the move again, but Kotaro would hold his ground again and kick his leg out to work on his neck before landing Gory Bomb Special and tops it off with the La Magistral for the pin and Koji would kick out various times whenever Koji would try to roll out of it and was so close to having a new champion. Koji would just use this time to hit a couple of STO’s in a row to weaken him down a bit. Koji would go for it again but he catches him for a Back Suplex to save himself a bit. Kotaro would now hit not one but two Excaliburs onto him to try and end it as Koji would somehow kick out of it again. It all came down to his as Koji would attempt the Koko no Geijutsu again as Kotaro would stop himself to pin him for a two count and they both would spin around as Koji would hit it this him but he picked him up to hit the Koko no Geijutsu properly this time and pins him to retain the title! After the match, various people from the junior division would come out and it looks like they all want a shot at the Junior Heavyweight Championship but Koji would have to pick one of them to be his opponent. It does look like, however, that Koji doesn’t have a clear opponent right now as he left the ring but I guess we’ll see soon. Review: Our next title match for this show is Strong BJ defending their titles against the team that they defeated them for, The Violence Giant. Strong BJ defeated them on January 13th to win the titles and after they retain their titles on the February 24 show, Violence Giant requested a rematch to bring the titles back home on their turf this time instead of the BJW show. If it’s anything like their previous match, it’s sure to be hard hitting and a not miss. Will Strong BJ remain on top or will Violence Giant bring the belts back home? Shuji and Daisuke would be the ones to start off our match here with an incredible display of power as the two were unable to budge and they would tag in their respective partners. 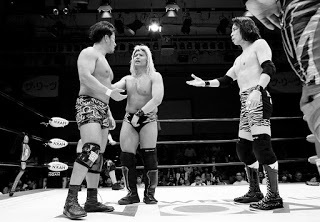 Suwama and Yuji were both also very hard-hitting as they would now fight outside of the ring as these two teams are making it personal. 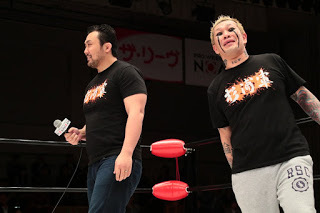 Strong BJ has been doing great work during this rivalry with the Violence Giant and they would even give Suwama a big beatdown but the former ace would even try his best to fight them off, even when he was on the corner and would kick Yuji to show his fighting spirit. Suwama would hit a Dropkick to save himself for a little bit and would tag in Shuji for the hot tag and Shuji does indeed come in hot with his Lariats, knees, anything he can throw along with the kitchen sink. Yuji would brawl with Shuji to deliver some chops while Shuji would give him a couple of forearms and a headbutt to try and daze him but Yuji is pumped up and slams him down with a few Lariats. Once Yuji would hit another Lariat to Shuji, he would kick out at one that time around before getting hit with another one with a two count. What’s it gonna take to take Shuji down for good? Yuji would get to the top rope to hit the Splash and it looks like this could be it but Suwama would break the pinfall to save his partner. Strong BJ would have them up for the Torture Racks but they would get down for Suwama to hit a Back Suplex while Shuji hits a Dragon Suplex. Shuji is alone with Yuji again and would hit another Dragon Suplex and a Running Knee to get him out for another two count, he was so close! Shuji would pick Yuji up real quick for the Fire Thunder and goes for the pin as Daisuke breaks the pinfall this time around as Suwama would get Daisuke out of the ring. Shuji knew what he had to do to try and end it as he hits the Giants Slam and pins Yuji to win back the titles! Hell of a match and definitely topped their previous encounter at BJW. I would love to see Violence Giant get a fair and dominating run with this reign, can’t wait to see where this goes now. Review: This is our third title match and the main event of the show as we have Kento Miyahara defending his Triple Crown Championship against former NEXTREAM member, Naoya Nomura. 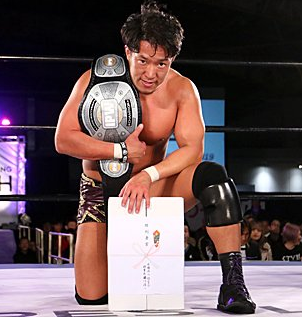 On the February 24th show, Naoya Nomura would defeat Dylan James in a singles match and Kento Miyahara would have his second successful title defense against Suwama. After Kento would defeat Suwama, Naoya would come in to make the challenge to his stablemate and announce his departure from the NEXTREAM group in the process, leading him to also vacate the All Asia Tag Team Championship with Yuma Aoyagi. Kento is now 30 years old and while it’s his third title defense in this run, this will be his first time defending it while no longer in his twenties. If Kento can defeat Naoya, he’ll be the champion leading into the Champions Carnival and won’t defend the title until the tournament is over. Will Kento be able to retain it once again or does Naoya pull the surprise victory? Kento came in here with a plan since he knew what he was gonna do to Naoya once he challenged him to this match, he didn’t wanna go easy on him despite being former teammates but he wants to see how badly Naoya wants the spotlight on him. They were fairly matched during the lock-up part of the match and they would start to fight outside for a little bit as Naoya would get Kento down as he taunts him when he got back in the ring. Naoya would hit him with a big forearm before going onto the apron to jump and Kento catches him with a knee and has him right where he wants him now. This is where Kento would just attack him with a few Headbutts as Naoya would try to deliver one to him but Kento gives him multiple ones as a counterattack and this is why you don’t mess with the champion. Naoya would eventually make a comeback after being kicked around by Kento as he quickly got up to charge at him with a shoulder tackle and you can hear that too. He would hit a few more along with another forearm to the face as he goes for the Brainbuster but Kento would struggle to make sure he didn’t hit it and has Naoya over the ropes but wait, Naoya grabbed his leg to pull him over as he attempted a Death Valley Driver onto the apron as Kento jumped off to hit a Blackout. The two would be on the turnbuckle and Naoya gets behind him to attempt a German Suplex as Kento struggles, but Naoya would slam Kento’s head on the post and gets off the turnbuckle to hit the German Suplex as both men are down. Naoya would go to the top rope to hit the first Splash as Kento kicked out but Naoya would quickly get up again to hit one more as Kento still kicked out. Kento would eventually hit him with a Blackout at full force and hits him with a German Suplex for another two count. Kento looks like he’s going for the Shutdown German Suplex Hold as Naoya would kick his knee out and hit him with a Spear and the two are down again. Kento would hit another Blackout on the back of his head and tries the German Suplex Hold once again as Naoya would still kick out at two as Kento is starting to get concerned with what he has to do now. Kento tried the Shutdown German Suplex Hold again as Naoya broke out of it and picked him up Fisherman style and dropped him on his head and picked him up for the Death Valley Driver as Kento fought him off but Naoya would hit him with a flurry of forearms to daze him and hits the Spear with the roll-up as Kento kicked out at two again! Naoya picked him back up but Kento would go back to delivering the Blackouts and it looks like Naoya is all out of fight as Kento finally hits the Shutdown German Suplex Hold to get the pinfall victory and his third successful title defense. Great match and a very impressive showing to Naoya but Kento is just still better than him right now. Kento will now officially be the Triple Crown Champion leading into the Champions Carnival. Three defenses down, eight more to go. 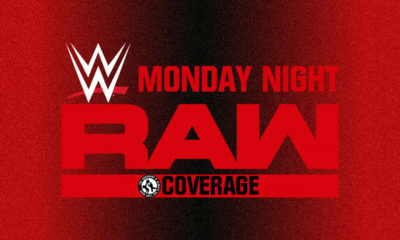 Overall: I thought it was a very solid show from top to bottom but the last three title matches were what sold it to me. 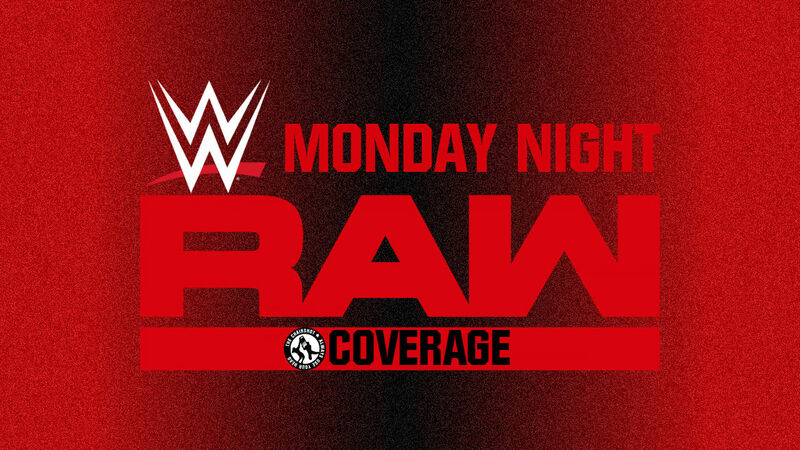 I would highly recommend that you look out for those matches if you can find them online or subscribe to the streaming service and if you’re not already subscribed, what the hell is wrong with you? Get on that!